I loved this story and have placed it in my books to read again pile! A must read and a great laugh that entertains the whole way through. The details the author provides really brought out the places and characters making each feel real and lovable. I could feel as if I was part of the story the whole time. Her telling of the story really drew me in, and I just couldn’t put this book down until the very end. This book really had me from the moment that Noah brought home Gracie and their relationship began. I laughed and cried this story and really fell in love with the main characters. This was a must-read book that I could not put down. I really enjoyed how real she made the characters and that you are able to sympathize with their lives. This is a fun and well written story. The story focus on Noah and His life as a happy bachelor while his mother is always trying to set him up. As the story develops, Gracie walks into his life and attempts to find him a perfect match. The author has a well written story with well developed characters and story line. A fun and enjoyable read that helps you escape from the everyday stress of life and take a great journey with the characters as they come to life. There was a beautiful, white-and-caramel Cavalier King Charles spaniel looking at him. Chicago author Marsha Casper Cook is also a screenwriter and radio show personality on Blog Talk Radio discussing writing, publishing and advocating October Breast Cancer Awareness. Her novels include romance, adventure, inspirational books, fiction, non-fiction and children’s stories. I could not put this down. The story is awesome and so realistic. Marsha clearly is a very good author as I have read her other books. This is a very heartwarming story. You will not be disappointed. Grand Central Station focuses on Jack Winston who is not only a child psychologist but has three best sellers. Victoria Feingold is a mom to three and a pediatrician. Her mom happens to be a huge fan of Jack and one weekend in Vegas the two meet and have a wild time. They come back home to Chicago and once Jack meets Victoria’s children, mom and sister in law he realizes he may not be prepared to live in a full house type situation. Honestly it’s understandable. I live in a quiet house even with my one kid and her house sounds like pure chaos most of the time. However, these two characters not only can be pretty funny but they are relatable and more than that they are memorable. I really enjoyed this book and I’ve recommended it to my mom because I know she too will enjoy how different of a story this one is. This is an amazing book for sure!! I loved every single part of it I just could not skip all those pages when they gave me a lot of entertainment. I am really into romantic stories, and this one gave me a lot of it and, a lot of fun. The plot was amazing and so the writing was as well, this one is a book that you usually want to read on a lazy afternoon when all you want to do is laugh a feel a little bit of love! I think the characters are just like anyone else with their own personalities, one of the things that I liked the most about the story is that it let us know (even when we already know it) that honesty means a lot when it comes to a relationship. If you are looking for a romantic comedy then this book was made for you!! This is a very good book. Funny and sincere. Highly recommend. Good easy read. Some events happen for a reason. Some unions of two people are totally unexpected. This is a story of love, romance, understanding, trust and most of all family loyalties. I really enjoyed this funny story about life and relationship and I would like to see this as a movie. It would be a lot of fun. 5.0 out of 5 stars Great Romantic Comedy!! I really enjoyed Grand Central Station. I don’t want to give away too much of the plot. The story incorporated several significant lessons, such as the importance of maintaining honesty in every relationship. The fact that a gambling problem shattered a family is all too realistic, and the reader truly felt the depth of Victoria's pain. The story also emphasized the importance of a cohesive family unit, which added greater complexity. The idea of a communal living arrangement was especially heartening. The author successfully created a heartwarming story filled with comedy and romance. This would make a great movie!! Chicago author Marsha Casper Cook is also a screenwriter and radio show personality on Blog Talk Radio discussing writing, publishing and advocating October Breast Cancer Awareness. Her novels include fiction, non-fiction and children’s stories. Allow two years to pass before we meet character 2 – Victoria Feingold – ‘Breakfast was not a pretty picture at the Feingold house. There was always so much going on that it could be very difficult to concentrate. Victoria Feingold sometimes referred to her household as “Grand Central Station,” because people were coming and going at all hours of the day. Despite the chaos, Victoria Feingold had a method to all the ongoing madness. She tried her best to ignore the noise, which was pretty easy for her because she was a pediatrician, and her office was loaded with crying kids all day long. Along with the crying came tantrums and vomiting. What a wonderful book. I loved al the humor, the family antics, the romance and the (mis) understandings. Take a lifelong Bachelor and pair him off with a woman who’s hands are more than just full, they are overflowing with commitments, family and pets and you get a hilarious yet charming romance that is all the more believable by the flaws in the characters portrayal. You won’t find perfection of character here, no, you get real people,……. and a talking dog? Yup, honesty, trust, and humor are important in relationships and this book does well in highlighting that fact. The two main characters have to overcome some issues, personal and together and they are definitely made for one another. The ace is greatly suited to this novel, it doesn’t drag, nor does it race through and you find love and warmth on most pages. I truly enjoyed this book. If you are tired of the same old romances, then read this book, I think it is worth your while. 5.0 out of 5 stars If You're Looking for an Enjoyable Romantic Ready for the Weekend or Vacation...This is it! 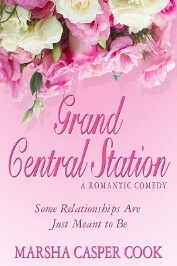 Grand Central Station:Some Relationships are Just Meant to Be by Marsha Casper Cook is a hoot!! Lighthearted and fun to read, perfect for a Sunday afternoon or vacation read, this book is a zany look at what happens when 2 doctors marry and one (Jack) inherits the others (Victoria's) crazy household. How hard can it be to make a commitment to another when you fall in love? But how about when when that commitment will include an ex-husband, children and a talking dog? Read this book and find out the hilarious way it can happen!! 5.0 out of 5 stars This author had a great idea and nailed it! A beautifully written story of luck, romance and trust. The story had humor and a great story line. You can't help but like the characters and humor isn't forced either. I enjoyed each character and their own stories. The author had a great idea and nailed it! I look forward to reading more from this author! It’s very rare for me to find a book like this one and as you keep reading, there is a constant giggle that it just can’t stop. Stories like this are a reminder that no matter the age or the rough pass of time, love will still come to you, from one way or another, a mother, a relative or a close person to you will always care and get worried about you and as twisted as your life might be, there is a solution for that too. I, honestly don’t have the words to express how much I love this book, especially because two months ago one of my beloved pet passed away and while reading this, I was remembering every moment of happiness I have with him, just because we have a language, can talk and complain it doesn’t mean dogs or animals in general don’t do that too, and considering the joy a pet brings to your life, it’s normal to suggest that this story happen to all of us in a daily basis. 5.0 out of 5 stars Sweet, fun, and enjoyable. The more Noah Meyers’ mother plays matchmaker the worse his blind dates end up. He knows she loves him but he doesn’t think he needs a wife at this time in his life. His practice in medicine keeps him busy and his work with special needs children make him happy; he doesn’t have time for a relationship. He does think adding a dog to his life will fill in those times he is lonely and bored at home. Gracie has a mission commissioned from up above to help Noah find the love that is right in front of him. Annie has been Noah’s foundation while getting his business up and running. He relied on her for multiple tasks that only made her more valuable as an employee, but it took a dog for him to really look at the beautiful woman that had loved him for years. A kink in the story could be the end of their blooming relationship before it really got started. Someone up above was looking out for several of the people in Noah’s life. Everyone deserves a fairy tale ending, and more than one couple receives one. Every now and then you need an easy-breezy comfort read – It’s Never Too Late for Love by Marsha Casper Cook is just that book. It is a predictable story, but the kind you still enjoy reading anyway because you enjoy the journey. For instance, you know just based off the title, that the main character will fall in love. But, you enjoy reading it and watching it happen. In this book, it is easy to enjoy the journey because the characters are delightful. Noah, the main character, is constantly being set up by his mother. And, she just keeps getting it wrong. The bad set-ups make for entertaining stories that will make you laugh. But, the true joy comes from the other main character, the dog, Gracie. Noah adopts Gracie, and Gracie has made it her mission to help him find love. And where does he find it? Right in front of him. Sound like a Hallmark movie? It reads like one too. Noah’s mom is a well-meaning woman, who only wants to see her son happy and settled down, with a lovely young woman, preferably with a few grandbabies on the way. If this doesn’t sound like most moms, than I have been in different circles. The characters in this book are fleshed out, well written and relatable. 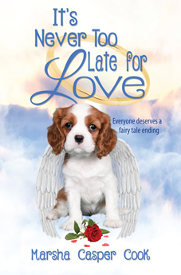 Even Gracie, the cute King Charles Spaniel, who in a twist becomes the main character, attempting to secure her own happiness by continuing the work that Noah’s mom has begun: setting him up to fall in love. There is a surprise twist that awaits Noah’s mom later on in the book. Something along the lines of “what comes around, goes around.” Funny, witty, heartfelt and inspiring, the love story has it all. You do not find this often anymore in love stories. It was sweet and a true pleasure to read. It did not feel sleazy but genuine. I loved this story and have placed it in my books to read again pile! A must read and a great laugh that entertains the whole way through. The details the author provides really brought out the places and characters making each feel real and lovable. I could feel as if I was part of the story the whole time. Her telling of the story really drew me in and I just couldn’t put this book down until the very end. This book really had me from the moment that Noah brought home Gracie and their relationship began. I laughed and cried this this story and really fell in love with the main characters. This was a must-read book that I could not put down. I really enjoyed how real she made the characters and that you are able to sympathize with their lives. 5.0 out of 5 stars Reads like an awesome Romantic Comedy...you will finish it in one sitting! In this heartwarming, romantic, and humorous tale in the style of 21st century magical realism, Marsha Casper Cook introduces us to Noah, an eligible, single Chicago bachelor who seems to have no luck meeting the right woman, despite numerous matchmaking attempts by his overly involved, well meaning, but perhaps slightly neurotic, stereotypical snowbird mother. When Noah picks out Gracie from a local pet shop, events begin to unfold that lead him toward a romantic, happily-ever-after ending with the perfect woman who had been right under his nose all along. Cook’s characters are compelling, the plot is engaging, and the pages fly. The story is almost Shakespearian in its various twists and turns, in the true sense of the words "Romantic Comedy." Far from presenting the clichéd sequence of events we would all expect from such a narrative of finding love in the big city, assisted by a magical, talking pet, Cook presents a fresh and believable cast of characters that pull us into their world. The book is also the perfect length for its genre, and will hold your attention in one sitting, much like a movie. Cook’s writing also speaks to some themes of our generation, such as the late twenty-something or early thirty-something crowd looking for love and meaning, reconciliation with the past, and of course, our love of pets, especially dogs. Highly recommend as a good read for anyone looking to enjoy a romantic comedy as they relax in the evening. 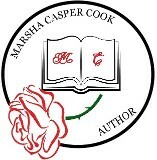 Author Marsha Casper Cook is also a screenwriter and radio show personality on Blog Talk Radio discussing writing, publishing and advocating October Breast Cancer Awareness as well as other worthy causes. She is the founder of Michigan Avenue Media. Her novels include romance, adventure, inspirational books, fiction, non-fiction and children’s stories. Having read many of her books, this reader is always impressed at the quality of Marsha’s writing, no matter the subject matter. This fine little book succeeds as an instructional health lesson as well as an entertaining children’s story. In this children’s book (one very much intended as a booster for parents and grandparents also in its message! ), Marsha, assisted by the fine illustrations of Mikey Brooks, we meet Addison Apple as he faces his mother who has prepared healthy oatmeal for his breakfast (Addison hates oatmeal, preferring cookies and candy) and while mother takes a telephone call Addison feeds the oatmeal to his dog Sammy, taking credit for finishing his oatmeal and fooling his mom. He stuffs his mouth with cookies (breaking the cookie jar) while his mom waits in the car to drive him to school. Not fooled his mother confronts Addison and, wisely, the lesson begins: Addison can eat whatever he picks out! He stuffs himself with sweets - gets sick. Addison wakes up the next morning to a breakfast of oatmeal – and he likes it! His mother’s wise response has changed his way of eating. 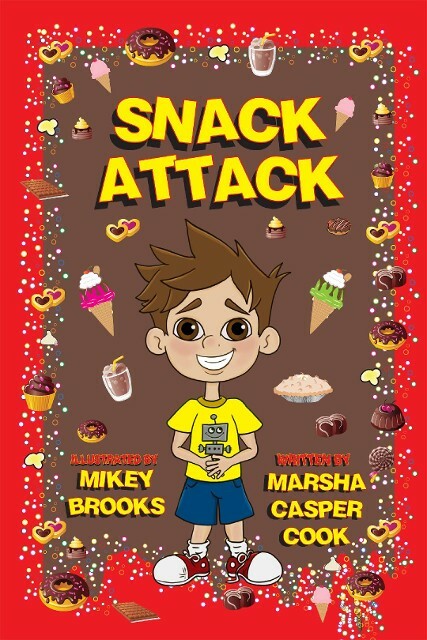 Snack Attack by Marsha Casper Cook is a terrific little book for kids that stresses the importance of healthy eating. When Addison is having breakfast with his mom, he is just barely choking down his oatmeal. Magically his dog Sammy eats all of the oatmeal while Addison's mom answers the phone and is distracted. Then it's time to go to school, and while Addison's mom waits in the car, Addison, in sneaking all of the cookies from the cookie jar, accidentally breaks the jar. He then decides to wait to tell his Mom. After school when the truth is revealed, and Addison declares that he wants to decide what to eat for himself,his mom lets him. After a while of eating candy, chips, and everything unhealthy, a stomach ache ensues for Addison, forcing him to change his ways. Cute illustrations, a basic yet potent message about healthy eating and simple writing make this a perfect book for kids Highly recommend.